And now that Google’s giving more real estate to local results, e-commerce is quickly beginning to see the benefits in thinking smaller. So if you want to bring in more traffic from your own backyard, these 5 steps will set you well on your way. …Or, more accurately, leave one. No, not that kind of nap. NAP stands for ‘Name, Address, and Phone Number’ – 3 things that should be on your website even if you don’t do any business in meatspace. So if they’re not, put them there now. This must be done in text, preferably on your main page or in a header or footer that shows up on all your pages. While I’m on the subject of addresses, try to verify the consistency of yours across the web. Use the same spelling each time. For example, if your business is listed as being on ‘North Fort Place Drive’ on your website, don’t refer to it as ‘North Fort Place Dr’, ‘N. Ft. Place Dr’, or ‘N. Ft. Pl. Dr.’ anywhere else. Pick one and stick to it. If you have more than one physical location in addition to your online store, create a dedicated ‘location’ page with all their NAPs, too. That will help them all place in the results instead of just the flagship one. And, if possible, your website’s page titles, URLs, image tags and copy should also include place names or local references. This is a simple form of what’s known in the industry as ‘keyword placement’, which I’ll discuss in detail in the next step. The place names are a bit obvious, but they’re just the tip of the iceberg when it comes to keyword placement. In order to know which other ones might help you draw in results, some keyword research is required. This part can get tricky. First of all, you’re looking for the keywords that people search for when they’re actually looking to buy something, not just the ones they search for when they’re browsing. And you don’t just want popular keywords, but also ones that aren’t also being used by all your competitors. Thankfully, opting for local SEO can help out with both of those at once, but more research will still be required. You can use a keyword research tool, like Google AdWords. Or, if you’re truly inexperienced with SEO and you have the budget for it, it’s a good idea to hire someone to handle this part. Once you have your list of locally relevant keywords, try to integrate them into your title, URLs, and copy – just like the place name. It’s also a good idea to create a video about one or more of your keywords. Videos are fifty-three times more likely to get onto the first page of Google than regular HTML pages. Since I’m assuming your online business is already established, there’s a good chance you’re already on them. But since I also have to assume, for the purposes of this article, that you’re not (paradox tolerance is an important part of article writing), Google My Business, Bing Places, and Yahoo Local Listings are the best places to start. As a side note, if you’ve NAPed properly on your website, Google may have already found your information and made you a business page. 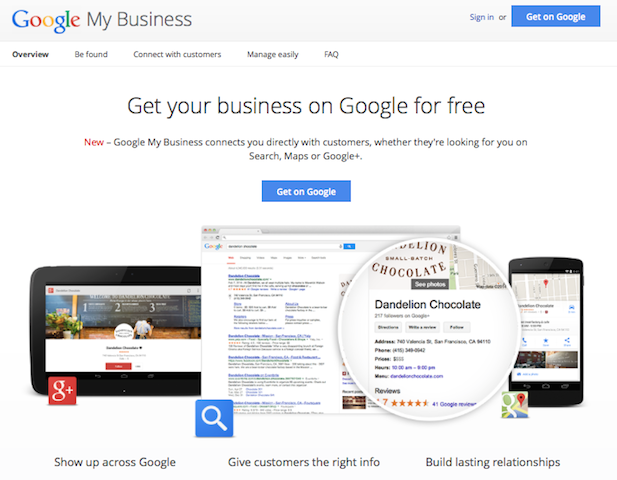 The easiest way to find it is to go to click on the big, blue ‘Get on Google’ button in the center, then search for your business name. 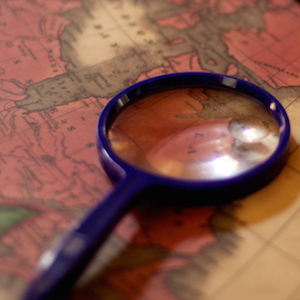 These three sites will help your local SEO immensely, but you shouldn’t stop there. If you want to go above and beyond, it’s good to register with as many as possible. Getting registered on local directories – like Yellow Pages and Yelp – is essential to getting more share in the local markets. You’ll not just get business from these sites, but also local links that’ll help increase search engine presence. A list of all the major ones can be found here, with many more available via Moz Local. Social media is increasingly important. As with any kind of SEO, it helps to have a Facebook page – the only difference being that it’s even more important to connect it to your location. 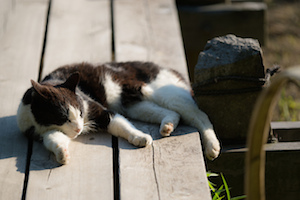 You should also have a sufficiently NAPed Google Plus page, too. Beyond that, additional social media presence is optional, but just like with review sites, more of it can only help your optimization efforts. Keywords are nice, but they’re useless if you don’t put them into something people actually want to read. If there’s no reason to click on your website, people won’t click on it. The best way to attract local audiences, is with good, locally relevant content. What makes content locally relevant? If there was a definite answer to that, I wouldn’t be discussing it in such vague terms. But, there is some (vague) advice I can give you: try blogging about the local [insert your industry here] industry, funny facts your reader might not know about it and news about local industry developments. If you can find a way to make them interesting, that is. If you’re a community-focused business, it might also help to talk about general developments in the area you’re targeting – as long as you can keep it semi-relevant to your business and avoid partisan political issues. Also, try searching for other people’s locally relevant content, sharing it, discussing it and reposting it. This will also have the benefit of increasing your local links and mentions on other websites and social accounts – which will really boost your presence. 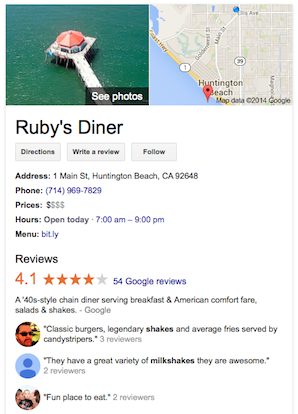 Having great reviews on your Google+ local page is one of the best publicity sources you can get, and it will give a nice boost to your SEO rankings. Ask your customers, both directly and through reminders on your site, to leave one. There are plenty of places where you can buy fake reviews, but you won’t hear about them from me. It’s not a good idea, anyway. It can lose you customers, get you banned from review sites and generally give you a reputation for dishonesty. Plus, most fake reviews aren’t very convincing. You can often spot one a mile away. It’s much better to get your reviews honestly, and work hard to make your business worthy of good ones. Since you’re an intelligent e-business owner, you’re probably doing that already, so… Keep up the good work! Next, become an active presence on review sites and respond to your customers’ reviews. That will encourage them to leave even more feedback. Optimizing your local results won’t happen overnight, and I recommend you do more research as you continue with the process. However, following the advice laid out in this article should set you well on the path to improving your results. Any other suggestions? Feel free to offer them up below.